“Reading the transcript, the impression I get is of an attempt to construct an alternative account of what happened. I don't think this is a good approach. It tends to exclude other possibilities from the debate ie the debate narrows to either jforjustice's account or the Home Office account. There are so very many discrepancies in what has been reported (as documented on this forum) that any number of plausible alternative accounts could be constructed, so I think it is unwise to promote one particular alternative. I think it is significant that the opponents of J7 have persistently used the taunt of "what do you think happened then? "; quite recently someone posted on another forum that we don't put our money where our mouth is. This is a trap. As soon as an alternative is put forward, the focus shifts from examining the official account to examining the alternative account. As far as I can see, all the material in "The Ripple Effect" has been available for a good two years, so I am curious as to why it is only now that this film has been released." So, what does Muad'Dib and 7/7 Ripple Effect claim 'most likely happened that day'? “Therefore, as part of the exercise, they would have recruited four young Muslim men to carry four backpacks, that were to contain mock explosive devices. Who were their Muslim recruits? These Muslim men would naturally buy return train tickets, and not one-way tickets, because they would be going home after playing their parts in the training exercise”. “The fake terrorists have been recruited, the suicide videos have been made, and everyone has been given basic instructions, for the day that the exercise is to be put into operation – 7/7/2005. The four mock-terrorist actors were to meet at Luton Train Station at 07:20 AM on the 7th of July 2005 and catch the 07:40 AM train from Luton to Kings’ Cross Thameslink Station, with their pretend-bomb backpacks, and then split up and catch three tube-trains and one bus, to pre-arranged destinations, where the fake explosions were to take place, as part of the training exercise. "The four men were supposed to arrive together, on time, at Luton Station, and be caught on CCTV, at 07:21:54 AM, entering the station, but three of them are not on the same video frames as Hasib Hussain, so have to be inserted later, using computer software. Hence the obviously, and very badly, doctored official single frame, time-stamped photo that we have been shown, from the CCTV outside Luton Station. They can’t show them moving, because it has been faked, that’s why they show only one single frame still photo. Why did the authorities have to fake this photo? They would have had to fake it, because three of the actors missed the tube-trains that they were supposed to catch, and which blew up without them being onboard, and so there was no video footage from Verint Systems of them boarding the three tube-trains, for the authorities to be able to use, as false evidence, to try to prove to the public that the Muslims were guilty. So they had to doctor and show us the fake photo instead". 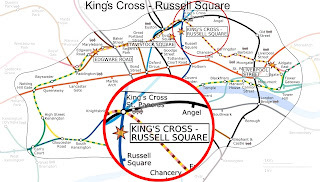 “The first available train the Muslim actors can catch, gets them to King’s Cross after the tube trains have already left without them. Hasib Hussain splits off from the other three at King’s Cross Thameslink station, because he still has time to catch the number 30 bus, as his part in the mock-terror exercise. When the tube-trains they were supposed to catch are blown up, the other three smell a rat and realise they have been duped, and are Muslim patsies who will be blamed for the attacks, and everyone knows what happened to Lee Harvey Oswald. “If we have at least three of the four "suicide-bombers" shot dead at Canary Wharf, and we KNOW they weren't on the tube-trains that blew up, because the 07:40 AM train from Luton to King's Cross was cancelled that day, then we have overwhelming proof that they did not blow the tube-trains up, and that the blowing up of the three tube-trains was an inside-job. At the Canary Wharf Docklands site there are media companies, for the Muslim patsies to have told their story to and cleared their names, if they could, and two possible escape routes, via air from the nearby London City Airport, that has flights to 34 destinations in the U.K. and Europe, and, if they couldn’t fly out, there was the possibility of getting a boat across the channel to France”. 7/7 Ripple Effect continues on in much the same vein, from which we can only conclude that using every known discrepancy in the reports of the events of July 7th, many of which are examined in detail by J7 in our sections Mind The Gaps I and II, and weaving them into a totally evidence-free and fanciful hypothesis, which would be more honestly described as a 'What If' rather than what 'Really did happen', will do more harm than good in aiding anyone to get to the truth of the events of that day. "... nor is joining up the loose ends in that wretched government "narrative" in the fashion of a Saturday night fictional TV thriller particularly likely to be viewed positively - drop the fantasy references, re-edit it to play as a 'what if?' docudrama that is clearly self explained/described as an unsubstantiated narrative the same as the official governmentt narrative is and it might get more respect, but as it stands, it's just too damn kooky for me to believe it's accidental. Sorry Maud, but the people you most need to reach are least likely to take you seriously - if that is a concern of course, and if it's not, then that says quite a lot." The advice of the J7 campaign and research collective is simple: Question everything. As an addendum to the rebuttal and rejection of 7/7 Ripple Effect, J7 received email notification from Muad'Dib requesting cash donations and assistance in contacting the bereaved families and survivors in order to send them unsolicited copies of this film. J7: The July 7th Truth Campaign immediately responded with a refusal to support or condone the film and J7 researchers universally condemned the intentions of Muad'Dib in the unsolicited sending of the film to bereaved families or survivors, re-iterating the point that J7: The July 7th Truth Campaign have never endeavoured to contact bereaved families or survivors. J7 are not in any way party to the making of the 7/7 Ripple Effect. We do not support the film, its producers, its unsubstantiated conjecture, or the sending of the film to relatives of victims or survivors, nor has J7 provided any assistance with locating relatives of the deceased. 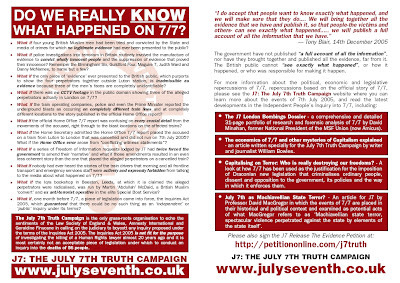 J7 have published the latest version of the July 7th Truth Campaign flyer. Click on the image below for larger, printable version or download PDF copies of the flyer for printing using the links at the end of this post. If you would like printed copies of the flyer, please contact J7 using the form on the J7 web site. A specially commissioned Channel 4 survey shows 59% of Muslims don't believe the government has told the whole truth about 7/7. The survey of 500 British Muslims, carried out by GFK NOP, found that nearly a quarter don't believe the four men identified as the London bombers were responsible for the attacks and 52% believe that the British security services have "made up" evidence to convict terrorist suspects. While the Channel 4 news survey focused on beliefs among the Muslim community, the J7 group of independent public researchers is comprised predominantly of non-Muslims and includes people of all races, colours and creeds indicating that similar research among the non-Muslim community would be likely to show similar results. "Well done Ch4 and thanks for bringing the survey and a number of important issues to the attention of the British public. Do bear in mind many British non-Muslims also question the official version of 7/7." “I am white and middle class, and I also think that the government has not told us the truth about 7/7. "I am a white female atheist and I don't believe the government has told us the whole truth about the 7/7 bombings. I don't believe the conspiracy theories either. So, for this survey you could also have asked Muslims, Sikhs, Christians and atheists what they thought. I'd be prepared to bet that the answer to the question 'has the government told the truth about 7/7' would be broadly similar in all of those." "The government and security services lied about weapons of mass destruction, they lied about the reason for the war, and after the shooting of an innocent man on the tube, more lies were told. Is it any wonder that many Muslims do not believe the government?! So do many non-Muslims." "I think you have missed the point somewhat, as it is not only a view commonly held among Muslims but also among many English nationals and people around the world." "You will find massive support for the Muslim view, and not just from Muslims." Also worth looking at is the list of over 1300 signatories of the J7 RELEASE THE EVIDENCE Petition which, once again, seems to indicate quite clearly that it isn’t just Muslims who don’t believe the government has told the whole truth about 7/7. In another piece on the Channel 4 web site, Darshna Soni highlights a few of the more egregious errors and inconsistencies in the official Home Office report, something that hasn’t been done since the Guardian article by Mark Honigsbaum which featured J7 (the J7 response to the article is here). You can watch Darshna Soni's original report, Survey: 'government hasn't told truth about 7/7', here, read viewer comments on the piece here and Darshna Soni's follow-up blog here. See also 7/7 The Conspiracy Theories which explains some of the anomaliles in the official story and Conspiracies and Cover-Ups. Given the historical and widely accepted history of terrorism on the British mainland, particularly with regard to alleged instances of 'Irish terrorism', it would be unwise not to acknowledge the lessons learned from the cases of the Guildford 4, Birmingham 6, Maguire 7, Danny McNamee and Judith Ward, amongst others. All of these people were convicted of terrorist crimes for politically expedient purposes and served long prison sentences on the basis of State-manufactured evidence and the suppression by the State of evidence that proved their innocence. The barbaric sentences handed out to five young men in the Crevice trial, based on the evidence of a Supergrass, the likely involvement of an intelligence services agent, as well as the use of forced confessions extracted under torture abroad are more recent examples of how similar tactics to those developed in Northern Ireland are now being used against British Muslim subjects, the perceived enemy of the day. It will be interesting to see if and how Channel 4 follow up the piece. 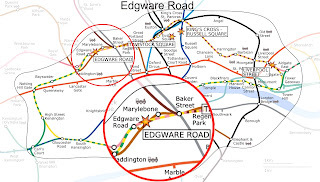 After many months of research J7 are pleased to publish a detailed analysis and summary of the events that occurred around the Edgware Road and Paddington areas of the London Underground on 7th July 2005. The analysis covers the official version of events including a timeline, how the story broke in the media, the confusing eye-witness accounts of sighting Mohammed Sidique Khan on the train, the MPS account of three trains being involved including 'a blast through a tunnel wall' and the discrepancies in the journeys of some of the victims. We also analyse the Resilience Mortuary and the strange use of two hotels as temporary morgues. The article also examines the TrackerNet images from the morning of July 7th, further anomalies surrounding the incident and a summary of the unanswered questions regarding the incident site. "If a country like the former Soviet Union, armed to the teeth and with the massive resources of the state could not achieve the alleged objective of overthrowing capitalism after seventy-five years, it is reasonable to ask the question, why has the British state embarked on a policy of creating a de facto police state replete with laws which have more than a passing similarity to those passed by both Hitler and Mussolini?" Writer and journalist William Bowles on The economics of 7/7 and other mysteries of capitalism explained in an article written specially for the July 7th Truth Campaign. 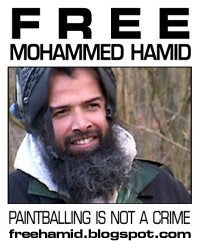 "Oh well......I wasn't using my civil liberties anyway"
Capitalising on Terror: Who is really destroying our freedoms? The threat of terrorist attacks cannot fail to be embedded into the consciousness of almost all who reside in this country. The UK has been under the shadow of terrorism for many decades from one 'enemy' or another. Even as the emergency response was still under way on the 7th of July 2005, politicians and public figures were praising the defiant spirit of the British public in the face of atrocity. However, it is fair to say that the psychological effects of such events vary across the general population. With the constant “When, not if” type warnings ringing in the ears of the British public, almost relentless news coverage of 'terror raids' and 'foiled plots', it is virtually impossible not to feel that we should be fearing for our safety. But how do we know we're being given an accurate picture of exactly what the threat is and from where it's coming? How do we know that if we live in a major city, every time we step out of doors or use the public transport system we will not be met with 'death and destruction on an unprecedented scale'? Recently the Archbishop of York, Dr John Sentamu, suggested that modern day Britain is comparable to Idi Amin's regime in Uganda. Around the same time the leader of Birmingham Central Mosque, Dr Mohammed Naseem, compared life for Muslims in the UK to that of the life of Jews in Nazi Germany. In among the furore that ensued among the liberal intelligentsia, the leader of the Conservative Party, David Cameron, gently reminded everyone that the laws don't just apply to Muslims, or terrorists, the laws apply to everyone. If you are reading this in Britain, that means you. Read the full article on the J7 site here. J7 are pleased to announce a major new area of content on the J7 web site, the J7 London Bombings Dossier - A Forensic Analysis of the London Bombings. The dossier was compiled and researched by former National President of the MSF Union (now Amicus), David Minahan. David also worked as a claims investigator for an insurance company and also a leading firm of solicitors and has extensive experience of 'forensic' investigation. The London Bombings dossier is a well-researched study and analysis of the events of 7th July 2005 and was received by the July 7th Truth Campaign in hard-copy format. Since receiving the hard copy version of the dossier, J7 have managed to obtain electronic copies of the dossier's summaries from the author. J7 researchers have verified the research contained within the dossier and converted the in-depth printed dossier into the electronic version that is reproduced here. The July 7th Truth Campaign are reproducing this dossier for the wealth of information it contains, the depth of research and its compilation of related pieces of information that, in the time that has passed since the events to which the dossier refers, seem to have disappeared from the public consciousness. J7 does not necessarily endorse the views, findings or conclusions contained in the dossier and is making the dossier available here for informational purposes. The original dossier consisted of “print offs” of various internet items, arranged into folders. Each individual folder consisted of around ten “exhibits” annotated with reference numbers in the top right hand corner of the page. The folders were divided into twenty six subject headings, and in five cases into two sub folders. There were, therefore, a total of thirty one folders, and approximately three hundred and ten exhibits. Although other relevant items came to light during the research, for ease of reference, each folder was restricted to ten items only. It is appreciated that different press reports may have come from the same agency source resulting in some duplication. As with the original dossier, in reproducing the information contained within it, wherever possible, priority has been given to the statements of named witnesses, either quoted in the press or, ideally on their own blogs. Also contemporaneous, (or near contemporaneous) reports from local papers, in particular the Evening Standard and the Hampstead and Highgate Express, rather than national newspapers, feature significantly. Each folder contains the writer's summary of its contents with reference made to certain of the exhibits. Hopefully, however, all the items are of relevance and not just those commented upon. The majority of the folders deal with sites of explosions, or suspected explosions. In addition there are eight that deal with background items - “advance warnings” “media restrictions” etc. As far as possible the folders have been arranged so that related sites and subjects follow chronologically. To read the complete dossier, please click here. Launched under six months ago, the J7 'Release the Evidence' petition has now been signed by over 1000 people. This is a clear indication of how strongly people feel that we need to see the facts about this atrocity. Thanks to everybody who's taken the time to sign and distribute the petition....all of you are a force for change. We were lucky enough to be offered an interview with ATS over the holidays, which you can read below. It was also discussed on their forum here. ATS: Thank you for taking time to answer some questions regarding July 7th, many at ATS will enjoy this interview. July 7th was a tragic day for the United Kingdom and many have demanded a public inquiry to what happened, but the Government has said no. Why won't the Government hold one? Thank you for offering J7 the interview and the opportunity to respond to your questions about 7/7 and the July 7th Truth Campaign. Why the government won't hold a public inquiry is a good question and one to which the government have given a number of responses, none of the which are particularly valid and none of which can be excused given the severity and magnitude of what happened. For the answer to why a public inquiry into the events of 7th July 2005 has not been held so far, it is perhaps best to refer to the words of the British Prime Minister, Tony Blair, who said: "If we ended up having a full scale public inquiry... we would end up diverting a massive amount of police and security service time and I don't think it would be sensible." Indeed, Downing Street has also dismissed the whole notion of a public inquiry as "a ludicrous diversion" so the government has made perfectly clear its opinion on an inquiry into the largest loss of life in London since the Luftwaffe bombings of the second world war. The nonsense of excuses presented by the government for not holding a public inquiry is further compounded for anyone who has any knowledge of other far less serious events into which the British government has held public inquiries. Tony Blair said: "I do accept that people want to know exactly what happened. We will make sure they do." Yet, to date, the people do not know exactly what happened, nor how it happened, nor who was responsible for making it happen. Yes, there is an 'official version' of events, the 'Report of the Official Account of the Bombings in London on 7th July' as released by the Home Office on 11 May 2006, but that story is flawed and inaccurate if the established facts have anything to do with it. Furthermore, the government account is not backed up with any tangible evidence - merely hearsay, speculation, assumptions and presuppositions - nor could it be because of the huge and glaring factual inaccuracies contained within it which, to this day, remain uncorrected and unclarified. J7 suggests that if the official account of events were the truth, then there would be no discrepancies, no errors, nor any inconsistencies in the account. Facts, after all, are facts but you won't find many, if any, of those in the official Home Office report. ATS: What do you say to those who have branded you and your team "Conspiracy Theorists", who are making outlandish theories and are refusing to accept the official story? The simple answer is that such a charge is completely invalid because, quite simply, we don't have a theory about what happened on 7/7! Our position from the outset has been that precisely nothing about the government and media versions of events makes any sense at all and, further, their story is entirely unsupported by evidence that would stand up in a court of law. Without a full and independent public inquiry, the events of 7th July 2005 will never face the judicial scrutiny that they deserve. Additionally, the judicial system in the UK operates on a presumption of innocence; that is, "Innocent until proven guilty". In the case of July 7th and the four young British men accused by the government of perpetrating the attack on London, there is no evidence in the public domain that conclusively proves their guilt and in this perhaps one might find at least part of the reason why the government has thus far refused to hold a public inquiry. Furthermore, it is imperative to understand exactly what a conspiracy theory is, for the actual definition is rather different to the conventional perception of what one is. While definitions of the word 'theory' are generally consistent, J7 always recommend that anyone who wishes to believe we are 'conspiracy theorists' refer to a dictionary and check the meaning of the word 'conspiracy'. An approximate legal definition of the word conspiracy is, "An agreement between two or more persons to commit a crime or accomplish a legal purpose through illegal action". If one applies that definition in the context of the term 'conspiracy theory', then any theory about what happened on 7/7 which involves more than one person conspiring to undertake the criminal activity that occurred that day is, technically, a 'conspiracy theory'. ATS:Was The July Seventh Truth Campaign influenced in anyway shape or form by the 9/11 truth movement in the United States? what might have happened if the official version of events is not what actually happened. Without a full and thorough investigation that examines all the available evidence, we think it is unwise to speculate what might have happened because, without a proper examination of the evidence, it is impossible to know. So, in terms of the influence of the U.S. 9/11 truth movement on the July 7th Truth Campaign, rather than speculate and further confuse issues we have chosen to highlight that there is no evidence in the public domain that could be used to prove conclusively one story or another about 7/7. This is precisely why we are calling on the government and authorities to release the evidence that either proves, or disproves, the official version of events as outlined in the Home Office 'narrative'. There are so many holes, speculations, inconsistencies and outright factual errors in the official story that it isn't really worth the paper it's printed on. We recommend that anyone who is interested enough to investigate further reads the official account of events as a starting point and decides for themselves whether or not the 41-page document could be considered credible or sufficient explanation for how 56 people were killed in the heart of London. Until 7th July 2005, so called anti-terrorist legislation in the UK was largely riding on the back of the events that occurred in New York on September 11th 2001, with occasional reference to the Madrid train bombings. Since 7th July 2005, British anti-terrorist legislation has undergone several revisions, all of which has sailed through Parliament, without question nor challenge, precisely because of 7/7. So, in answer to your question, yes, the official story - if the errors and anomalies in it are ignored and the story is taken at face value - has absolutely provided all the justification the government needs to roll out any legislation it requires. In addition to facilitating the unhindered passing of 'anti-terrorism' legislation, 7/7 has also resulted in the demonisation, dehumanisation and vilification of Muslims by much of the mainstream media. This unquestionably racist propaganda has been ramped to such a level that barely a day goes by without the news featuring stories, usually with little or no basis in fact, about the perceived threat from young, British-born Muslims. ATS: On that the day, the four men traveled to London via a train from Luton. Metropolitan Police confirmed that they took the 0740 Thameslink train from Luton to Kings Cross on the morning of July 7th. However, The July Seventh Truth Campaign has called this "the impossible train journey". What do you mean by that? "The impossible train journey," means precisely that, an impossible train journey. Any credible theory about what happened on 7th July 2005 requires facts upon which it should be based, yet the official government account of events places the accused on a 7.40am Luton to King's Cross Thameslink train which, categorically, was cancelled and did not run that day. This might seem like a minor detail, but if the government, with all the 'intelligence' and 'security' resources it has at its disposal, cannot obtain and report such a basic and easy to verify fact correctly, how much faith can anyone place in the rest of their story? that the Home Office did not obtain the train time information from the train operating company. It then transpired that the Home Office had not even bothered to check the train details with the police, so one might be tempted to ask quite where they obtained the erroneous information about what we refer to as the impossible train journey. Since then, Dr Reid has been forced to acknowledge additional errors in the Home Office report, including crucial details such as the precise locations of the explosions on the trains involved. In fact, as far as the Home Office report goes, they are expecting the British public to believe that they have not yet managed to determine the type of the explosives used. Well, the forensic testing processes that would determine the type of explosives used would produce results in anything from a few minutes to a few hours. A worst case example might require a couple of days to produce the results so, yet again, the British public would do well to wonder why the government was unable to identify the explosives in 10 months of investigation. ATS: Last question. The Government has said no to a public inquiry and is still refusing the calls to have one by many groups. A public inquiry, in the eyes of the Government, would be waste of time and effort that will distracting for them. In your own words, why is a public inquiry so important? times, including at close range. In the aftermath of his killing, evidence emerged that police and military intelligence agents had colluded with Loyalist paramilitaries in his murder. There were also allegations of an official cover-up of such collusion. As a result of the Inquiries Act 2005, Mr Finucane's widow wrote to the judiciary calling on them to boycott any inquiry held under the terms of the act into her husband's death. Congressman Chris Smith named the Parliamentary bill that preceded that act "the Public Inquiries cover-up bill" and the act that was passed effectively renders ultimate control of all public inquiries to the executive, meaning that any inquiry held under its terms would result in the government investigating itself and determining which aspects of 7/7 are investigated and reported, or if they are investigated at all. The Inquiries Act also prevents investigation of the security services and grants the government the right to shut down any or all avenues of inquiry at their discretion. As any reasonable person will understand, this is a less than desirable position and will not produce anything that vaguely resembles a truly Independent Public Inquiry. What is interesting to note is that, of all the diverse groups calling for a public inquiry, only the July 7th Truth Campaign has raised the issue of the Inquiries Act 2005 as being a major obstacle to obtaining an independent inquiry. For the record, Amnesty International has called for the boycott of inquiries proposed under the terms of the Inquiries Act 2005 and, to date, no judges have been found that will agree to participate in an inquiry into the killing of Patrick Finucane. J7's position is that if the Inquiries Act is not fit for the purpose of investigating state collusion in the killing of one man almost 20 years ago, then it is certainly not fit for the purpose of investigating the killing of 56 people on 7th July 2005. Consequently, the July 7th Truth Campaign's calls for a public inquiry specifically state that any inquiry into the events of 7/7 must be a public inquiry and that it must be conducted outside of the terms of the Inquiries Act 2005 and, further, that this piece of legislation needs to be repealed.